For other people with similar names, see Father Damien (disambiguation) and Saint Damien (disambiguation). 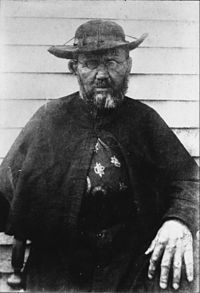 Father Damien or Saint Damien of Molokai, SS.CC. or Saint Damien De Veuster (Dutch: Pater Damiaan or Heilige Damiaan van Molokai; 3 January 1840 – 15 April 1889), born Jozef De Veuster, was a Roman Catholic priest from Belgium and member of the Congregation of the Sacred Hearts of Jesus and Mary, a missionary religious institute. He won recognition for his ministry from 1873 to 1889 in the Kingdom of Hawaiʻi to people with leprosy (also known as Hansen's disease), who were required to live under a government-sanctioned medical quarantine on the island of Molokaʻi on the Kalaupapa Peninsula. During this time, he taught the Catholic faith to the people of Hawaii. Father Damien also cared for the patients himself and established leadership within the community to build houses, schools, roads, hospitals, and churches. He dressed residents' ulcers, built a reservoir, made coffins, dug graves, shared pipes, and ate poi from his hands with them, providing both medical and emotional support. After eleven years caring for the physical, spiritual, and emotional needs of those in the leper colony, Father Damien realized he had also contracted leprosy when he was scalded by hot water and felt no pain. He continued with his work despite the infection but finally succumbed to the disease on 15 April 1889. Father Damien has been described as a "martyr of charity". He was the tenth person in what is now the United States to be recognized as a saint by the Catholic Church. In both the Latin Rite and the Eastern Rites of the Catholic Church, Father Damien is venerated as a saint. In the Anglican communion, as well as other denominations of Christianity, Damien is considered the spiritual patron for leprosy and outcasts. Father Damien Day, April 15, the day of his passing, is also a minor statewide holiday in Hawaii and to this day Father Damien is the patron saint of the Diocese of Honolulu and of Hawaii. Upon his beatification by Pope John Paul II in Rome on 4 June 1995, Blessed Damien was granted a memorial feast day, which is celebrated on 10 May. Father Damien was canonized by Pope Benedict XVI on 11 October 2009. The Catholic Encyclopedia calls him "the Apostle of the Lepers." Father Damien was born Jozef ("Jef") De Veuster, the youngest of seven children and fourth son of the Flemish corn merchant Joannes Franciscus ("Frans") De Veuster and his wife Anne-Catherine ("Cato") Wouters in the village of Tremelo in Flemish Brabant in rural Belgium on 3 January 1840. Growing up on a farm, it was assumed that he would eventually take over the farm. Instead, Jozef attended college in Braine-le-Comte, then entered the novitiate of the Congregation of the Sacred Hearts of Jesus and Mary in Leuven. He took the name of Brother Damianus (Damiaan in Dutch, Damien in French) in his first vows, presumably in reference to the first Saint Damian, an early Christian saint who was said to perform miracles. Following in the footsteps of his older sisters Eugénie and Pauline (who had become nuns) and older brother Auguste (Father Pamphile), Damien became a "Picpus" Brother (another name for members of the Congregation of the Sacred Hearts of Jesus and Mary) on 7 October 1860. His superiors thought that he was not a good candidate for the priesthood because he lacked education. However, he was not considered unintelligent. Because he learned Latin well from his brother, his superiors decided to allow him to become a priest. During his ecclesiastical studies, Damien prayed daily before a picture of St. Francis Xavier, patron of missionaries, to be sent on a mission. Three years later when Damien's brother Father Pamphile could not travel to Hawaiʻi as a missionary because of illness, Damien was allowed to take his place. On 19 March 1864, Damien landed at Honolulu Harbor on Oahu. He was ordained into the priesthood on 21 May 1864, at what is now the Cathedral of Our Lady of Peace, originally built by his religious order, the Congregation of the Sacred Hearts of Jesus and Mary. Today it serves as the Cathedral of the Bishop of Honolulu. In 1865 Father Damien was assigned to the Catholic Mission in North Kohala on the island of Hawaiʻi. While Father Damien was serving in several parishes on Oʻahu, the Kingdom of Hawaiʻi was struggling with a labor shortage and a public health crisis, as identified by planters. Many of the parishioners Native Hawaiians had high mortality rates to such Eurasian infectious diseases as smallpox, cholera, influenza, syphilis, and whooping cough, brought to the Hawaiian Islands by foreign traders, sailors and immigrants. Thousands of Hawaiians died of such diseases, to which they had no acquired immunity. It is believed that Chinese workers carried leprosy (later known as Hansen's disease) to the islands in the 1830s and 1840s. At that time, leprosy was thought to be highly contagious and incurable. Later the medical community determined that roughly 95% of human beings are immune to it and, in the 20th century, developed effective treatment. In 1865, out of fear of this contagious disease, Hawaiian King Kamehameha V and the Hawaiian Legislature passed the "Act to Prevent the Spread of Leprosy". This law quarantined the lepers of Hawaii, requiring the most serious cases to be moved to a settlement colony of Kalawao on the eastern end of the Kalaupapa peninsula on the island of Molokaʻi. Later the settlement of Kalaupapa was developed. Kalawao County, where the two villages are located, is separated from the rest of Molokaʻi by a steep mountain ridge. Even in the 21st century, the only land access is by a mule trail. From 1866 through 1969, a total of about 8,000 Hawaiians were sent to the Kalaupapa peninsula for medical quarantine. The Royal Board of Health initially provided the quarantined people with food and other supplies, but it did not have the manpower and resources to offer proper health care. According to documents of that time, the Kingdom of Hawaiʻi did not intend for the settlements to be penal colonies, but the Kingdom did not provide enough resources to support them. The Kingdom of Hawaii had planned for the lepers to be able to care for themselves and grow their own crops, but, due to the effects of leprosy and the local environmental conditions of the peninsula, this was impractical. According to researcher Pennie Moblo, accounts about the colony from the 19th well into the 20th century have overstated its poor condition, adding to the myth of the European saviors for the colony and the island, whose government was eventually controlled by European Americans. For instance, most of the houses and other buildings were constructed and owned by the residents, even after the change of government and increased investment by the Territory of Hawaiʻi. By 1868, according to the Catholic Encyclopedia (1911), "Drunken and lewd conduct prevailed. The easy-going, good-natured people seemed wholly changed." This seems to be an account fulfilling the contemporary European ideas about the Hawaiians more than an accurate record of conditions. There is evidence that lay volunteers offered to help on the island, and that the Hawaiians would have preferred a native priest, if one had been available. While Bishop Louis Désiré Maigret, the vicar apostolic of the Honolulu diocese, believed that the lepers needed a Catholic priest to assist them, he realized that this assignment had high risk. He did not want to send any one person "in the name of obedience". After much prayer, four priests volunteered to go, among them Father Damien. The bishop planned for the volunteers to take turns in rotation assisting the inhabitants. On May 10, 1873, the first volunteer, Father Damien, arrived at the isolated settlement at Kalaupapa, where 816 lepers then lived, and was presented by Bishop Louis Maigret. At his arrival he spoke to the assembled lepers as "one who will be a father to you, and who loves you so much that he does not hesitate to become one of you; to live and die with you". Damien worked with them to build a church and establish the Parish of Saint Philomena. In addition to serving as a priest, he dressed residents' ulcers, built a reservoir, built homes and furniture, made coffins, and dug graves. Six months after his arrival at Kalawao, he wrote to his brother, Pamphile, in Europe: "...I make myself a leper with the lepers to gain all to Jesus Christ." During this time, Father Damien had not only cared for the lepers, but also established leadership within the community to improve the state of living. Father Damien aided the colony by teaching, painting houses, organizing farms, organizing the construction of chapels, roads, hospitals, and churches. He also personally dressed residents, dug graves, built coffins, ate food by hand with lepers, shared pipes with them, and lived with the lepers as equals. Father Damien also served as a priest during this time and spread the Catholic Faith to the lepers; it is said that Father Damien told the lepers that despite what the outside world thought of them, they were always precious in the eyes of God. Father Damien, seen here with the Kalawao Girls Choir during the 1870s. Some historians believed that Father Damien was a catalyst for a turning point for the community. Under his leadership, basic laws were enforced, shacks were upgraded and improved as painted houses, working farms were organized, and schools were established. At his own request and of the lepers, Father Damien remained on Molokaʻi. Many such accounts completely overlooked the roles of superintendents who were Hawaiian or part-Hawaiian. However, Pennie Moblo states that until the late 20th century, most historic accounts of Damien's ministry revealed biases of Europeans and Americans, and nearly completely discounted the roles of the native residents on Molokaʻi. William P. Ragsdale was a highly popular and effective mixed-race attorney and politician who was part Hawaiian; he had served as an interpreter and in other government posts. After finding that he had contracted leprosy, he "gave himself up to the law", and was appointed to serve as superintendent at Kalaupapa in 1873. He led it until his death in 1877. His popularity led to his being called "Governor." Father Damien succeeded him briefly as superintendent, but he gave that up after three months in February 1878 in favor of another appointee. His superiors did not want priests serving in government posts. King David Kalākaua bestowed on Damien the honor of "Knight Commander of the Royal Order of Kalākaua". When Crown Princess Lydia Liliʻuokalani visited the settlement to present the medal, she was reported as having been too distraught and heartbroken at the sight of the residents to read her speech. The princess shared her experience, acclaiming Damien's efforts. Consequently, Damien became internationally known in the United States and Europe. American Protestants raised large sums of money for the missionary's work. The Church of England sent food, medicine, clothing, and supplies to the settlement. It is believed that Damien never wore the royal medal, although it was placed by his side at his funeral. Father Damien worked for 16 years in Hawaii providing comfort for the lepers of Kalaupapa. He gave the people not only faith, but also homes and his medical expertise. He would pray at the cemetery of the deceased and comfort the dying at their bedsides. In December 1884 while preparing to bathe, Damien inadvertently put his foot into scalding water, causing his skin to blister. He felt nothing and realized he had contracted leprosy after 11 years of working in the colony. This was a common way for people to discover that they had been infected with leprosy. Despite his illness, Damien worked even harder. In 1885, Masanao Goto, a Japanese leprologist, came to Honolulu and treated Damien. He believed that leprosy was caused by a diminution of the blood. His treatment consisted of nourishing food, moderate exercise, frequent friction to the benumbed parts, special ointments, and medical baths. The treatments did relieve some of the symptoms and were very popular with the Hawaiian patients. Damien had faith in the treatments and said he wanted to be treated by no one but Goto, who eventually became good friends with Father Damien. Despite the illness slowing down his body, in his last years, Damien engaged in a flurry of activity. He tried to complete and advance as many projects as possible with his time remaining. While continuing to spread the Catholic Faith and aid the lepers in their treatments, Damien completed several building projects and improved orphanages. Four volunteers arrived at Kalaupapa to help the ailing missionary: a Belgian priest, Louis Lambert Conrardy; a soldier, Joseph Dutton (an American Civil War veteran who left behind a marriage broken by alcoholism); a male nurse, James Sinnett from Chicago; and Mother (now also Saint) Marianne Cope, who had been the head of the Franciscan-run St Joseph's Hospital in Syracuse, New York. Conrardy took up pastoral duties; Cope organized a working hospital; Dutton attended to the construction and maintenance of the community's buildings; and Sinnett nursed Damien in the last phases of illness. With an arm in a sling, a foot in bandages, and his leg dragging, Damien knew death was near. He was bedridden on 23 March 1889, and on 30 March he made a general confession. Damien died of leprosy at 8:00 a.m. on 15 April 1889, aged 49. The next day, after Mass said by Father Moellers at St. Philomena's, the whole settlement followed the funeral cortège to the cemetery. Damien was laid to rest under the same pandanus tree where he first slept upon his arrival on Molokaʻi. In January 1936, at the request of King Leopold III of Belgium and the Belgian government, Damien's body was returned to his native land in Belgium. It was transported aboard the Belgian ship Mercator. Damien was buried in Leuven, the historic university city close to the village where he was born. After Damien's beatification in June 1995, the remains of his right hand were returned to Hawaii and re-interred in his original grave on Molokaʻi. Father Damien had become internationally known before his death, seen as a symbolic Christian figure caring for the afflicted natives. His superiors thought Damien lacking in education and finesse, but knew him as "an earnest peasant hard at work in his own way for God." News of his death on 15 April was quickly carried across the globe by the modern communications of the time, by steamship to Honolulu and California, telegraph to the East Coast of the United States, and cable to England, reaching London on 11 May. Following an outpouring of praise for his work, other voices began to be heard in Hawaiʻi. Representatives of the Congregational and Presbyterian churches in Hawaii criticized his approach. Reverend Charles McEwen Hyde, a Presbyterian minister in Honolulu, wrote in August to fellow pastor, Reverend H. B. Gage of San Francisco. Hyde referred to Father Damien as "a coarse, dirty man", who contracted leprosy due to "carelessness". Hyde said that Damien was mistakenly being given credit for reforms that were made by the Board of Health. Without consulting with Hyde, Gage had the letter published in a San Francisco newspaper, generating comment and controversy in the US and Hawaiʻi. People of the period consistently overlooked the role of Hawaiians themselves, among whom several had prominent roles of leadership on the island. Later in 1889 Scottish author Robert Louis Stevenson and his family arrived in Hawaii for an extended stay. He had tuberculosis, then also incurable, and was seeking some relief. Moved by Damien's story, he became interested in the controversy about the priest and went to Molokaʻi for eight days and seven nights. Stevenson wanted to learn more about Damien at the place where he had worked. He spoke with residents of varying religious backgrounds to learn more about Damien's work. Based on his conversations and observations, he wrote an open letter to Hyde that addressed the minister's criticisms and had it printed at his own expense. This became the most famous account of Damien, featuring him in the role of a European aiding a benighted native people. If that world at all remember you, on the day when Damien of Molokai shall be named a Saint, it will be in virtue of one work: your letter to the Reverend H. B. Gage. ...I have set down these private passages, as you perceive, without correction; thanks to you, the public has them in their bluntness. They are almost a list of the man's faults, for it is rather these that I was seeking: with his virtues, with the heroic profile of his life, I and the world were already sufficiently acquainted. I was besides a little suspicious of Catholic testimony; in no ill sense, but merely because Damien's admirers and disciples were the least likely to be critical. I know you will be more suspicious still; and the facts set down above were one and all collected from the lips of Protestants who had opposed the father in his life. Yet I am strangely deceived, or they build up the image of a man, with all his weakness, essentially heroic, and alive with rugged honesty, generosity, and mirth. Since then historians and ethnologists have also studied Damien's work and the life of residents on Molokaʻi. For example, Pennie Moblo assesses the myth and controversy about the priest in the context not of religious conflict between Protestants and Catholics, but of changes in relations in Hawaiʻi between the royal house, European-American planters and missionaries, and native residents, in the years of the overthrow of the government and assumption of power by Americans. Among the facts left out of early accounts praising Father Damien was that the residents of the leper colony wanted a native priest, that lay volunteers were rejected, and that residents asked in 1878 that the priest be replaced. As Hawai'ians were literate, they spoke for themselves. In this period, Damien had patient J.K. Kahuila, a Hawaiian Protestant minister, put in irons and deported to Oahu because he believed the man was too rebellious. Kahuila got a lawyer and demanded investigation of Damien. Moblo concludes that in most 19th and 20th-century accounts, "the focus on Damien eclipses the active role played by Hawaiians and preserves a colonially biased history." The political and journalistic world can boast of very few heroes who compare with Father Damien of Molokai. The Catholic Church, on the contrary, counts by the thousands those who after the example of Fr. Damien have devoted themselves to the victims of leprosy. It is worthwhile to look for the sources of such heroism. In 1977, Pope Paul VI declared Father Damien to be venerable. On 4 June 1995, Pope John Paul II beatified him and gave him his official spiritual title of Blessed. On 20 December 1999, Jorge Medina Estévez, Prefect of the Congregation for Divine Worship and the Discipline of the Sacraments, confirmed the November 1999 decision of the United States Conference of Catholic Bishops to place Blessed Damien on the liturgical calendar with the rank of optional memorial. Father Damien was canonized on 11 October 2009 by Pope Benedict XVI. His feast day is celebrated on 10 May. In Hawaii it is celebrated on the day of his death, 15 April. Two miracles have been attributed to Father Damien's posthumous intercession. On 13 June 1992, Pope John Paul II approved the cure of a nun in France in 1895 as a miracle attributed to Venerable Damien's intercession. In that case, Sister Simplicia Hue began a novena to Father Damien as she lay dying of a lingering intestinal illness. It is stated that pain and symptoms of the illness disappeared overnight. In the second case, Audrey Toguchi, a Hawaiian woman who suffered from a rare form of cancer, had remission after having prayed at the grave of Father Damien on Molokaʻi. There was no medical explanation, as her prognosis was terminal. In 1997, Toguchi was diagnosed with liposarcoma, a cancer that arises in fat cells. She underwent surgery a year later and a tumor was removed, but the cancer metastasized to her lungs. Her physician, Dr. Walter Chang, told her, "Nobody has ever survived this cancer. It's going to take you." Toguchi was surviving in 2008. In April 2008, the Holy See accepted the two cures as evidence of Father Damien's sanctity. On 2 June 2008, the Congregation for the Causes of Saints at the Vatican voted to recommend raising Father Damien of Molokaʻi to sainthood. The decree that officially notes and verifies the miracle needed for canonization was promulgated by Pope Benedict XVI and Cardinal José Saraiva Martins on 3 July 2008, with the ceremony taking place in Rome and celebrations in Belgium and Hawaii. On 21 February 2009, the Vatican announced that Father Damien would be canonized. The ceremony took place in Rome on Rosary Sunday, 11 October 2009, in the presence of King Albert II of the Belgians and Queen Paola as well as the Belgian Prime Minister, Herman Van Rompuy, and several cabinet ministers, completing the process of canonization. In Washington, D.C., President Barack Obama affirmed his deep admiration for St. Damien, saying that he gave voice to voiceless and dignity to the sick. Four other individuals were canonized with Father Damien at the same ceremony: Zygmunt Szczęsny Feliński, Sister Jeanne Jugan, Father Francisco Coll Guitart and Rafael Arnáiz Barón. Damien is honored, together with Marianne Cope, with a feast day on the liturgical calendar of the Episcopal Church (USA) on 15 April. This reredos of Father Damien in the Episcopal St. Thomas the Apostle Hollywood shows cross-denominational veneration of the priest. Director David Miller made a short film of Father Damien's life entitled The Great Heart (1938), released by MGM. The first full-length film on Father Damien was Molokai (1959), a Spanish production directed by Luis Lucia with Javier Escrivá, Roberto Camardiel, and Gérard Tichy playing the main roles. Ken Howard had the title role in the television film Father Damien: The Leper Priest (1980); he replaced David Janssen, who died suddenly after a couple of days of shooting. Stephanie J. Castillo's documentary Simple Courage (1992) explores Damien and his work, drawing parallels between the treatment of persons with leprosy and the stigma associated with those with AIDS. "Simple Courage" was rewarded an EMMY Award in 1993. Belgian film producer Tharsi Vanhuysse produced and Paul Cox directed the film Molokai: The Story of Father Damien (1999). Interviews of former residents are featured in the documentary The Soul of Kalaupapa: Voices of Exile (2011). It focuses on the efforts in the 19th century of Belgian-born Father Damien and Hawaiian Jonatana Napela, an LDS convert, working with persons with leprosy in Kalaupapa and collaborating on ecumenical efforts. Screenwriter and film director John Farrow wrote the biography Damien the Leper (1937). In 1939, RKO Pictures purchased the book for a feature film titled Father Damien, to be directed by Farrow and star Joseph Calleia. The project was not realized. The poetic dramatization Father Damien (1938) was written by Edward Snelson, later Joint Secretary to the Government of India (1947), KBE, and dedicated ‘To G.’, the actress Greer Garson, to whom he had been married in 1933. The one-man play Damien by Aldwyth Morris, was broadcast nationally on PBS in the United States in 1978 and again in 1986 on "American Playhouse". The broadcast received a number of recognitions including a Peabody Award. The 2016 novel God Made Us Monsters by William Neary explores Father Damien's rise to sainthood. The Father Damien Statue on the steps of the State Capitol Building honors him, and a replica is displayed in the National Statuary Hall Collection in the United States Capitol. Statues in memory of Damien can be found in many Belgian cathedrals, such as the Tournai Cathedral, St Bavo's Cathedral, Ghent, and St Martin's Cathedral, Ypres. In 2005, Damien was honored with the title of De Grootste Belg, chosen as "The Greatest Belgian" throughout that country's history, in polling conducted by the Flemish public broadcasting service, VRT. He ranked third on Le plus grand Belge ("The Greatest Belgian") in a poll by the French-speaking public channel RTBF. In 1952, the Picpus Fathers (SS .CC) opened the Damien Museum, (Dutch: Damiaanmuseum ) in Tremelo, Belgium, in the house Damien was born and grew up. In 2017 the museum was completely renovated. With canonization highlighting his ministry to persons with leprosy, Father Damien in his work has been cited as an example of how society should minister to HIV/AIDS patients. 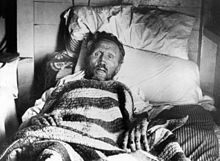 On the occasion of Damien's canonization, President Barack Obama stated, "In our own time, as millions around the world suffer from disease, especially the pandemic of HIV/AIDS, we should draw on the example of Father Damien’s resolve in answering the urgent call to heal and care for the sick." Several clinics and centers nationwide catering to HIV/AIDS patients bear his name. There is a chapel named for him and dedicated to people with HIV/AIDS, in St. Thomas the Apostle Hollywood, an Episcopal parish. The Damien The Leper Society is among charities named after him that work to treat and control leprosy. Damien House, Ireland, is a centre for "peace for families and individuals affected by bereavement, stress, violence, and other difficulties with particular attention to Northern Ireland". Saint Damien Advocates is a religious freedom organization that says it wants to carry on Father Damien's work with orphans and others. Schools named after him include Damien High School in Southern California, Saint Damien Elementary School in Calgary, Canada, and Damien Memorial School in Hawaii. The village of Saint-Damien, Quebec is also named after him. Churches worldwide are named after him. St. Damien of Molokaʻi Catholic Church in Edmond, Oklahoma, dedicated in 2010, is believed to have been the first Roman Catholic church in the continental United States to be named for Saint Damien after his canonization. A Traditional Latin Mass church, it is operated by the Priestly Fraternity of St. Peter (FSSP) and was authorized in 2010 by Eusebius J. Beltran, Archbishop of Oklahoma City. Pontiac, Michigan (in the Catholic archdiocese of Detroit) has a St. Damien parish. The Damien and Marianne of Moloka'i Heritage Center was established at the St. Augustine by the Sea Catholic Church in Honolulu; Marianne of Molokaʻi was canonized in 2012. The center is open several hours every day except holidays. ^ Downes, Patrick (26 April 2013). "St. Damien's feast day not the customary date of death". Hawaii Catholic Herald. Honolulu, HI. Retrieved 4 September 2013. ^ a b "Father Damien". Capitol Campus/Art. The Architect of the Capitol. Retrieved 21 July 2010. ^ De Broeck, William (1913). "Congregation of the Sacred Hearts of Jesus and Mary and of the Perpetual Adoration of the Blessed Sacrament of the Altar". In Herbermann, Charles (ed.). Catholic Encyclopedia. New York: Robert Appleton Company. Retrieved 21 February 2009. ^ a b c d Tayman, John (2007). The Colony: The Harrowing True Story of the Exiles of Molokai. New York: Simon and Schuster. ISBN 978-0-7432-3301-9. ^ "Blessed Damien de Veuster, ss.cc". Congregation of the Sacred Hearts of Jesus and Mary. Archived from the original on 17 July 2012. Retrieved 2 August 2012. ^ See: List of American saints and beatified people#List of American saints. ^ a b "'Apostle of the Lepers,' Spanish mystic among 10 to be canonized". Catholic News Agency. www.catholicnewsagency.com. Retrieved 21 July 2010. ^ a b "Pope Proclaims Five New Saints". Radio Vaticana. Archived from the original on 25 May 2012. Retrieved 21 July 2010. ^ Boeynaems, Libert H. (1913). "Father Damien (Joseph De Veuster)". In Herbermann, Charles (ed.). Catholic Encyclopedia. New York: Robert Appleton Company. Retrieved 21 February 2009. ^ a b "Saint Damien – Servant of God, Servant of Humanity". Cathedral of Our Lady of Peace. Cathedral of Our Lady of Peace. Archived from the original on 11 March 2005. Retrieved 2010-07-21. ^ Catholic Online. "St. Damien of Molokai". catholic.org. Retrieved 2 February 2017. ^ a b "Pater Damiaan "de Grootste Belg aller tijden"" (in Dutch). NOS. 2 December 2005. Archived from the original on 16 April 2014. Retrieved 2 August 2012. ^ "Blessed Damian De Veuster". Biography. Congregation of the Sacred Hearts of Jesus and Mary. 10 May 2007. Retrieved 21 February 2009. ^ Eynikel, Hilde (1997). Damiaan: De Definitieve Biografie. Leuven: Davidsfond. p. 82. ISBN 978-90-6152-586-8. ^ Dutton, Joseph (1913). "Molokai" . In Herbermann, Charles (ed.). Catholic Encyclopedia. New York: Robert Appleton Company. ^ "House Resolution 210". Hawaii State Legislature. Archived from the original on 2 January 2016. Retrieved 2 August 2012. ^ "St. Damien Day Hawaii October 11". Hawaii Free Press. Retrieved 2 August 2012. ^ "The lepers of Molokai" (PDF). The New York Times. 26 May 1889. p. 13. Retrieved 21 July 2010. ^ Daws, Gavan (1984). Holy Man: Father Damien of Molokai. University of Hawaii Press. p. 162. ISBN 978-0-8248-0920-1. ^ Edmond, Rod (2006). Leprosy and Empire: A Medical and Cultural History. Cambridge University Press. ISBN 978-0-521-86584-5. ^ "St. Damien of Molokai: Servant of God – Servant of Humanity". St. Augustine by-the-sea Roman Catholic Church. St. Augustine-by-the-Sea. Archived from the original on 13 July 2010. Retrieved 2010-07-21. ^ a b Carr, Sherie (10 October 2009). "Hawaii's Father Damien: From priesthood to sainthood". Hawaii Magazine. Retrieved 2 August 2012. ^ Damien the Leper. Patterson, New Jersey: The Franciscans of St. Anthony's Guild. 1974. ^ "Damien The Leper". EWTN. Retrieved 2 August 2012. ^ "The Life of Father Damien". The Star-Bulletin. Honolulu, Hawaii. 7 October 2009. ^ a b c d e Stevenson, Robert Lewis (1922). Father Damien – An Open Letter to the Reverend Dr. Hyde of Honolulu. The Works of Robert Louis Stevenson, Volume 15. W. Heinemann in association with Chatto and Windus, Cassell and Longmans, Green. pp. 479–501. ^ Moblo, "Blessed Damien of Molokai" (1997). Note: "Carelessness" was a reference to the association at the time of leprosy with syphilis as a sexually transmitted disease. ^ a b c Bernardo, Rosemarie (4 July 2008). "Aiea woman excited for her saint in making". The Star-Bulletin. Retrieved 11 October 2009. ^ Downes, Patrick (28 March 2003). "Tribunal to examine Blessed Damien miracle claim". Hawaii Catholic Herald. Honolulu, Hawaii: Diocese of Honolulu. Archived from the original on 24 July 2011. Retrieved 2010-07-21. ^ "Vatican Votes To Elevate Father Damien To Sainthood". KITV Honolulu. www.kitv.com. Archived from the original on 5 April 2012. Retrieved 21 July 2010. ^ Sweas, Megan. "Obama Says St. Damien Gave Voice to Voiceless, Dignity to the Sick." Catholic News Service. 14 October 2009. ^ Donadio, Rachel (11 October 2009). "Benedict Canonizes 5 New Saints". The New York Times. Retrieved 13 October 2009. ^ "Molokai, la isla maldita (Molokai, the cursed island, 1959)". Internet Movie Database. Retrieved 21 July 2010. ^ "Father Damien: The Leper Priest (1980) (TV)". Internet Movie Database. Retrieved 21 July 2010. ^ "Molokai: The Story of Father Damien (1999)". Internet Movie Database. Retrieved 21 July 2010. ^ a b Welch, Rosalynde (21 April 2010). "The eighth circle of paradise: Father Damien of Molokai and Jonathan Napela in Kalaupapa". St. Louis Post-Dispatch, Religion blog. Retrieved 25 February 2013. ^ Farrow, John (1937). Damien the Leper. Camden, N.J.: Sheed and Ward. OCLC 8018072. ^ "'Damien the Leper' Purchased by RKO; Robert Sisk to Be the Producer — Joseph Calleia Has Been Assigned to Title Role". The New York Times. 17 May 1939. Retrieved 27 November 2015. ^ "Hollywood Buys 45 More Stories to Add to 1940 Feature Programs". Motion Picture Herald. 136 (1): 34. 1 July 1939. Retrieved 27 November 2015. ^ Snelson, Edward (1938). Father Damien – A Play. Longmans, Green and Co., London-New York-Toronto. ^ "About Bill Neary". www.billneary.com. Retrieved 1 June 2016. ^ These include: "Father Damien, Aid to Lepers, Now a Saint". Associated Press. 11 October 2009; De Volder, Jan and John L. Allen, Jr. (FRW). The Spirit of Father Damien: The Leper Priest. Ignatius Press, 2010. p. x; Haile, Beth. "Articulating a Comprehensive Moral Response to HIV/AIDS in the Spirit of St. Damian of Molokai". CatholicMoralTheology.com. 10 May 2011; "Brief Biography of St. Damien of Molokai" Archived 11 February 2012 at the Wayback Machine. St. Damien Catholic Church, Oklahoma City, OK; "The Canonization of Father Damien". FlandersHouse.org. ^ Donadio, Rachel. "Benedict Canonizes 5 New Saints". The New York Times. 11 October 2009. ^ These include: Damien Ministries – Washington, D.C. Archived 8 November 2011 at the Wayback Machine; Damien Center – Central Indiana; Albany Damien Center – Albany, New York; Schenectady Damien Center – Schenectady New York Archived 11 January 2012 at the Wayback Machine. ^ "Home". Saintdamienadvocates.org. 8 June 2012. Archived from the original on 7 April 2014. Retrieved 15 April 2014. ^ "On Second Anniversary of the Affordable Care Act Passage, Hawaii Residents Join 140 Cities Across the Nation to Rally Against Its Impact on Religious Freedom". Hawaii Reporter. Retrieved 15 April 2014. ^ "St. Damien School, CCSD". Retrieved 25 October 2018. ^ "St. Damien of Molokai Parish, Pontiac MI". www.facebook.com. Retrieved 21 January 2016. ^ "Museum | St. Augustine By The Sea Parish". Staugustinebythesea.com. Retrieved 15 April 2014. Daws, Gavan (1984). Holy Man: Father Damien of Molokai. Honolulu: University of Hawai'i Press. ISBN 0-8248-0920-3. Eynikel, Hilde (1999). Molokai: the Story of Father Damien. Staten Island: Alba House. ISBN 0-8189-0872-6. Stewart, Richard (2000). Leper Priest of Moloka'i. Honolulu: University of Hawai'i Press. ISBN 0-8248-2322-2. Bunson, Margaret; Bunson, Matthew (2009). Apostle of the Exiled: St. Damien of Molokai. Huntington, Indiana: Our Sunday Visitor, Inc. ISBN 978-1-59276-610-9. Edmond, Rod (2006). Leprosy and Empire: A Medical and Cultural History. Cambridge Social and Cultural Histories. 8. Cambridge University Press. ISBN 0-521-86584-0. Gould, Tony (2005). A Disease Apart: Leprosy in the Modern World. Macmillan. ISBN 0-312-30502-8. Michaels, Barry (2009). Saint Damien de Veuster: Missionary of Moloka'i. Boston: Pauline Books & Media. ISBN 0-8198-7128-1. This page is based on the Wikipedia article Father Damien; it is used under the Creative Commons Attribution-ShareAlike 3.0 Unported License (CC-BY-SA). You may redistribute it, verbatim or modified, providing that you comply with the terms of the CC-BY-SA.